Only quality coins used! Silver plated cufflink closures hard solder directly to the coins for a solid bond! 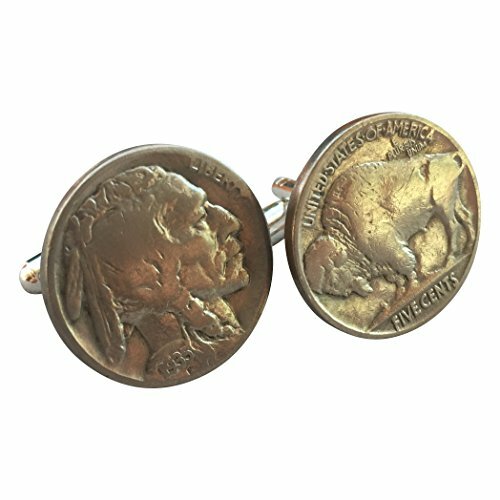 Exquisite cufflinks with genuine Buffalo Nickels minted 1913-1938. The Buffalo Nickel is considered one of the most beautiful and charming American coins of all time. It features an Indian Head on the front and a Buffalo on the back. Includes a Certificate of Authenticity. Here is an actual rare coin mounted to a cufflink post, making it a great fashion statement. With most coins in the US, there is an interesting story. Soon after the Indian Head nickel went into circulation they discovered that the "FIVE CENTS" inscription, which was on a raised mound at the bottom of the reverse, was one of the highest spots on the coin, and thus wore away very quickly. As a result, the design was modified by Charles Barber during its first year of production. Barber removed the raised mound and lowered the relief of the inscription so that it would not wear away as quickly, along with other design changes. However, one problem that was not addressed was the placement of the date. Like "FIVE CENTS" in the original design, the date was placed at a relief that exposed it to a great deal of wear. These a crafted in the U.S.A. by a local artisan. 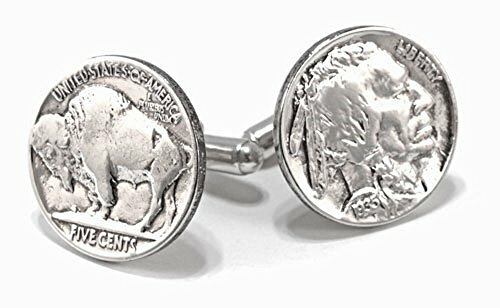 Buffalo Nickel coin cufflinks with sterling silver actions. The Buffalo nickel was produced between 1913 and 1938 and has to be one of the most widely known and loved American coins. One side shows the buffalo and the other is the indian head. The sterling silver actions are marked 925 on the inside. What better way to reuse part of our nations coin history than in a fantastic pair of cufflinks? PLEASE REMEMBER THAT THESE COINS WERE CIRCULATED AND USED AND ARE OVER 70 YEARS OLD. THE DATES MAY VARY FROM THOSE SHOWN IN THE PHOTO AS THESE ARE JUST ONE PAIR THAT WERE PHOTOGRAPHED. THEY ARE CLEANED AND CAREFULLY BUFFED OR POLISHED, AS UNLIKE SOME CUFFLINK MANUFACTURERS WHO JUST TAKE THEM OUT OF A BAG FROM THE COIN DEALER AND USE THEM, THESE ARE TREATED WITH CARE Presentation Boxed. Made in the USA. Authentic coins were hand painted by an artist. Genuine, high quality coins were used for this pair. These celebrate the United States of America and are a fantastic gift for a true patriot. These cufflinks arrive in a handsome gift box like all of our designs. Inspired by the Smithsonian's National Numismatic Collection, American coins honor the tradition and history of our country. A piece of history richly displayed in wearable form. 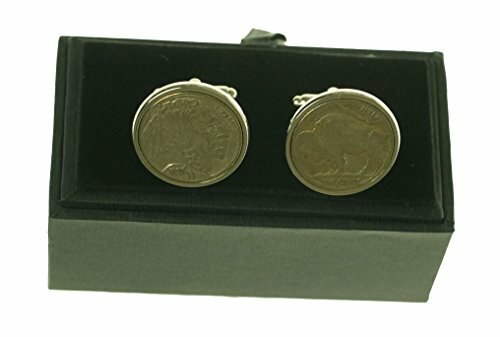 Exquisite cufflinks with genuine Buffalo Nickels minted 1913-1938. 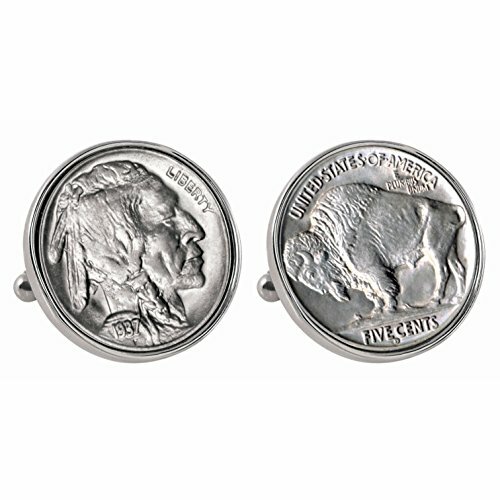 The Buffalo Nickel is considered one of the most beautiful and charming American coins of all time. It features an Indian Head on the front and a Buffalo on the back. Includes a Certificate of Authenticity. 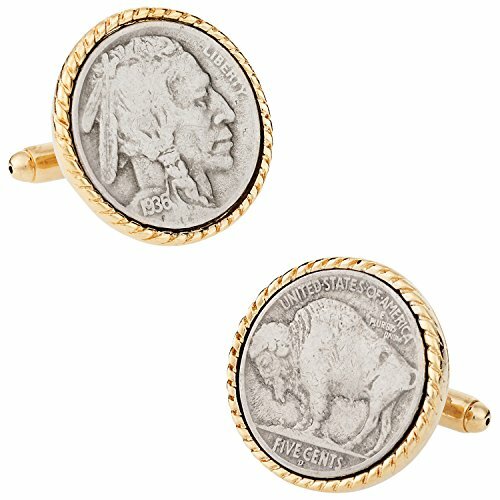 Authentic Buffalo Nickel Indian Head coin cufflinks. The coins were polished using a mechanical buffer and received a secondary finish by hand. 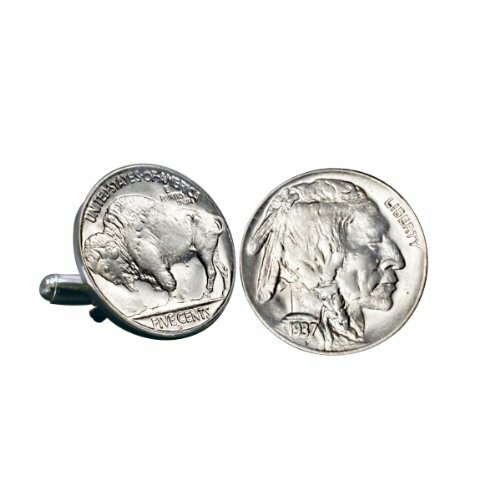 One cufflink features the Indian side of the coin. 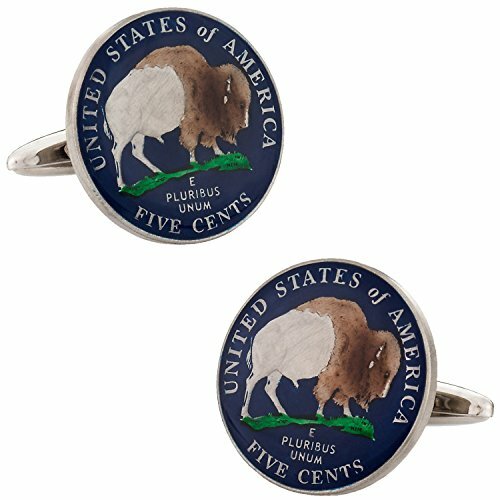 The other cufflink features the Buffalo side of the coin. The coins were then placed on base metal cufflink and measure approximately 18mm. Authentic Buffalo Nickels with gold plated trim. A piece of American history that you can wear with pride. Comes packaged in black box. 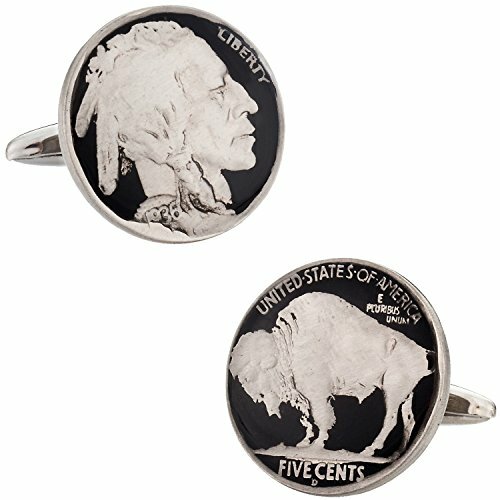 Compare prices on Buffalo Nickel Cufflinks at ShopPlanetUp.com – use promo codes and coupons for best offers and deals. We work hard to get you amazing deals and collect all available offers online and represent it in one place for the customers. Now our visitors can leverage benefits of big brands and heavy discounts available for that day and for famous brands.